. Tsuruoka mingei 鶴岡民芸 folk art from Tsuruoka . At the temple 延命寺 Enmei-Ji in Karigawa 東田川郡狩川村 there is a stone statue of Hiyaku San. If you rub his cheeks, your toothache will be healed. This legendary animal lives in the ceiling and watches over dreams. If you have a bad dream, you should not tell anybody about it, but go out and pray to the sun (tentosama テントサマ（太陽）with the following words, three times to make the bad dreams stop. I pass on the bad dream from last night to the Baku in the ceiling.
. baku makura 獏枕 tapir pillow and dreams - Introduction . In the village of 大広 Daiko, if there is 旱魃 a long drought and people need rain, they go to the pond at the 薬師社 Yakushi Shrine and clean it. During that time others perform rain rituals. Since the crucian carp, which lives in this pond, does not like it to be cleaned, he lets rain fall soon.
. buna 鮒 crucian carp .
. katame buna 片目鮒 crucian carp with one eye - Legends . The Fudo statue at the "Red Waterfall" has special power to heal diseases of the eye. He sometimes transforms into a huge serpent, but people who have seen the animal are cursed and do not dare to talk about it. Once upon a time there lived a senkan chooja 千貫長者 rich millionaire at river 狩川 Karigawa.
. 千貫長者 Senkan Choja, the rich millionaire . After the defeat of the war, many ladies from the castle threw themselves into the pond and died. Until our day the water of the pond is muddy. The ladies turned into white serpents and continued to protect the treasures of the castle. If someone sees a white serpent and talks about it, he/she is sure to die. Tsuruoka Park lies within the grounds of the old Tsurugaoka Castle, in Tsuruoka, Yamagata prefecture. It is famous for its cherry trees. The Sakai clan lived in this castle for about 250 years as the Shonai domain head. The park is dotted with the remains of the old stone walls along the moat. An old cedar tree, thousands of years old, reminds you of the castle and its past. At the home of 五十嵐与七 Igarashi Yoshichi in Tsuruoka there is a huge tree with a hollow where a white serpent with ears lives 耳のある白蛇. If anyone sees the animal, he/she will turn blind or die. If you come near or try to cut a tree, you will be punished in a less lif-threatening way. kame yokose 鴨よこせ "Give me back my duck!"
. sugi 杉 伝説 Cryptomeria legends . On the 15th day of the 11th lunar month people prepare mochi 餅をつく rice cakes, because Sake no Osuke descended the Mamurogawa river. "If a human happened to hear the cry of the salmon masters, he would die on the spot. Therefore the people pounded rice, making much noise, and kept to the house, in order not to hear it". Now it was a widespread custom in Japan for somebody to close his ears with two rice cakes when he heard of the death of a friend of a same age. Thus he pretended not to hear the bad news, and wanted to ward off possible ominous effects on himself." 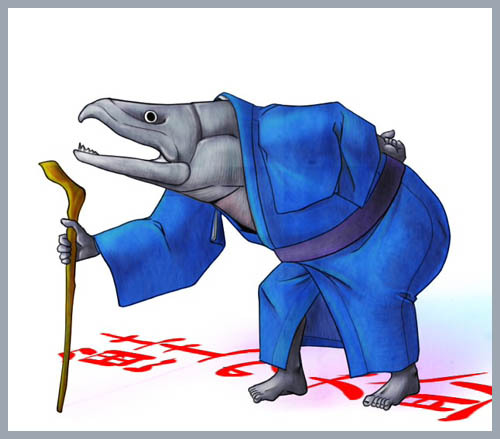 Women had to stay in their homes and men were also forbidden to see the salmon.
. Oosuke, ōsuke, Daisuke 鮭の大助 / 鮭の大介 legends about the salmon king .
. Daikoku Ten 大黒天 - 大国 Okuninushi - Mahakala . Sometimes when walking at night on a dark road, people have the feeling someone is following them, but beware - never turn round to see if there is anyone. and people stop and ask it to overtake them. ゴウリキさん、先さこう - Goki San, please go ahead. Then the moster stops following them from behind.